HCPV refers to Heliostat Concentrator Photovoltaic which is a specialized solar PV technology using large lenses to focus and beam concentrated sunlight to solar cells. Heliostat Concentrator Photovoltaic is a technology which uses a large area of lenses or mirror collectors (heliostats) to focus and beam sunlight in highly concentrated form to a small area of solar cells. The concentrated light is then directly converted to power. As compared to the average conversion efficiencies of other existing PV technologies such as a-Si (8% – 10%), CdTe (12%) and c-Si (16% to 18%), conversion efficiency of HCPV can reach 34% and more, with cell efficiency between 38% to 39%. 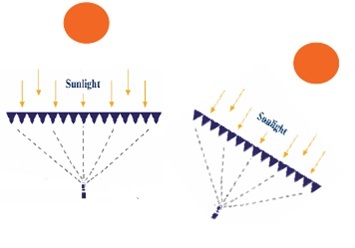 The specialty of HCPV systems as compared to normal PV technologies lies in the application of highly specialized lenses, providing optimal performance at direct sun irradiation. As the sun changes its position at sky in the course of a day, a HCPV system are usually equipped with a solar tracking system, ensuring the continuous supply of the system with direct rays. HCPV systems are especially potential in areas with high DNI (Direct Normal Radition) which means at least an average daily DNI of 5 to 6 kWh/m² per day. They are especially high-performing in deserts and other areas with rough climates, particularly in North Africa, Southern Africa, the Arabian Peninsula, South Asia and Australia. HCPV systems are in that sense particularly suitable as space- and cost-saving off-grid power systems for people living in these remote and rough areas.